Abersoch Holiday Cottage at Cilan Fawr Holidays,Abersoch,Lleyn Peninsula, Gwynedd, North Wales, Abersoch holiday accommodation, Abersoch Camping and Caravan Site, for caravans and tents, also Cilan Riding Centre, Abersoch horse riding. Croeso/Welcome to Cilan Fawr Holidays. We are a long established family business, Cilan Fawr Holidays is situated on the Cilan Headland overlooking Abersoch, Hells Mouth Bay (Porth Neigwl), Bardsey Island (Ynys Enlli - Isle of Saints) and the Snowdonia mountain range. The Lleyn Peninsula is bathed by the Gulf Stream giving Abersoch and the surrounding area a mild, temperate climate throughout the year. All the activities associated with a coastal holiday resort are available at their very best, at Abersoch. These include sailing, surfing, swimming, fishing, golfing, rambling, horse riding and cycling, to name but a few. Further afield, but within easy reach, are the Little Trains of Wales, Museums, castles and the magnificent Snowdonia range, with Snowdon the hightest mountain in Wales. The Lleyn Peninsula is designated as an area of outstanding natural beauty and Cilan Headland as a Site of Special Scientific Interest, having rare flora and fauna. The views are truly stupendous with panoramic sights of Bardsey Island, Hells Mouth Bay, Snowdonia and Cardigan Bay.The several sandy beaches along the coastline of the Lleyn are within easy reach from the Abersoch area. Local beaches are only a few minutes away. 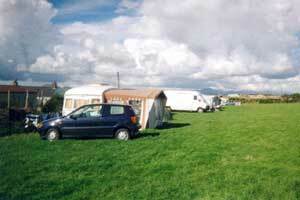 We offer self catering accomodation in our properties, as well as camping on our Camping and Caravan Certificated Site. 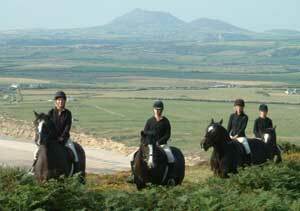 Our Visit Wales accredited Cilan Riding Centre is available for Pony Trekking during the main summer season. Emlyn and Hilda Williams live at Cilan Fawr and are available throughout the year to welcome you and your family. Conveniently situated one and a half miles from the centre of Abersoch village. The bungalow has full central heating (combination night store/convector heaters) and is available throughout the year, including Christmas and New Year. 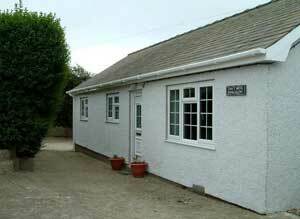 A modern comfortable three bedroom bungalow. Camping and Caravainning Certificated Site. A quiet family site situated on the Cilan headland, with panoramic views of Hell's Mouth Bay, Bardsey Island and Snowdonia. Ideal for water sports enthusiasts, and lovers of the countryside and sea area, who enjoy the wildlife (rare flora and fauna) and panoramic views of the Lleyn peninsula, or enjoy walking, fishing, sailing, golf, water sports, horse riding, surfing, jet skiing, swimming, cylcing, visiting Snowdonia and other local places, or just relaxing. Ladies & Gents flush toilets and showers. Wales Trekking & Riding Association Approved. Hourly rides on the Cilan Headland. Experience, novice riders and children welcome. 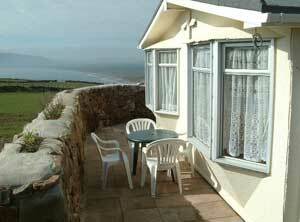 Please contact Emlyn & Hilda Williams, Cilan Fawr, Cilan, Abersoch, North Wales LL53 7DD. for rates, availablity and further information. Whilst every care is taken to ensure that details given in any document, map, photograph, plan or on the internet etc., are correct, the owner or agent reserve the right to alter or amend amenities or facilities without prior notice. A view of Abersoch from the Cilan headland.